This one is a little out there (sort of like the truth) but bear with me: as any X-Phile knows, Thanksgiving used to be OUR day. Now it seems to be stuck in an endless loop of 007 movies, the Twilight Zone, and whatever show a network decides to market the hell out of. But The X-Files marathon on Thanksgiving used to be where it was at: TV Guide even had a little ballot in the weeks before where you could vote for what episodes you wanted to see. I mean, can we bring stuff like this back? It was awesome. Lucky for me, many of my favorites were also established favorites and I could guarantee their spot on the list. There had to be a television where I was peeling potatoes or getting the ingredients together for stuffing. There. Had. To. Be. And I was usually obliged. However, sometimes disaster struck. For a few years in my life, Thanksgiving wasn’t actually held at my house with an intimate group of relatives. No, I was carted off to another family’s Thanksgiving where not only was I denied the comfort of my own home, I was also denied easy access to The X-Files marathon. One particularly crummy Thanksgiving it was also my birthday. I have distinct memories of wandering around this house, pitifully telling anyone who I felt had the right to know that it was my birthday and at that moment all I wanted for my birthday was to be able to sit in peace and watch The X-Files. I wasn’t the most normal 9-year-old, I will give you that. And that is how I associate The X-Files with Thanksgiving. In particular, I know I would always vote for “Darkness Falls” and “Humbug.” If it was an option, definitely “Jose Chung’s ‘From Outer Space’.” And without fail, you could always expect to see “Home,” an episode that always sticks with you. I always happened to tune in when this episode was starting, I swear…I know exactly how to recognize it…a baseball field appears…And more than likely you would expect to see “Pusher,” “Bad Blood,” “Triangle,” and “X-Cops.” Us fans tended to lean toward the quirkier X-files on our holidays; major mysteries like Samantha Mulder could be left for more run-of-the-mill marathons. In my distress over realizing that Thanksgiving has never quite been the same since new episodes of Friends aired on the actual holiday, I got to thinking about what I remember watching last year: Man v. Food (I mean what better way to get psyched about food?) 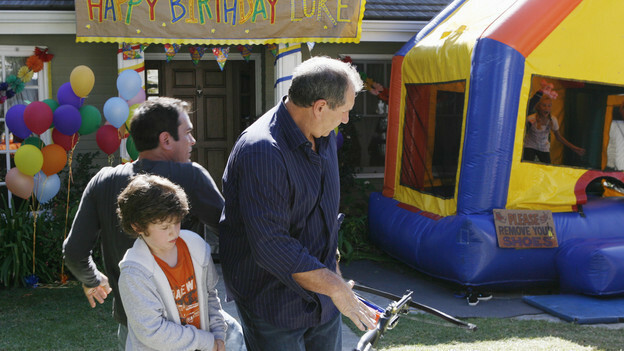 and Modern Family’s “Fizbo” episode. It is not a Thanksgiving episode but still runs with a theme I completely identify with: it is Luke’s birthday (one of my favorite Dunphys) and because his birthday always lands around Thanksgiving he never has a proper party (like this girl). So this year they decide to concentrate on Luke and stage an elaborate party replete with a bouncy house, a zip line, and a craft station for comb sheaths. For his contribution Cam wants to come as “Fizbo” his clown (classically trained Auguste) alter ego: “If I wasn’t in school or fishing,…I was clownin’”. We soon learn that Phil is very afraid of clowns and the appearance of Fizbo creates chaos at the party by setting of a chain reaction of events leading to Luke breaking his arm. In what is perhaps my favorite line in Modern Family history, Phil explains: “I am not really sure where the fear comes from. My mother says it’s because as a kid I found a dead clown in the woods but, who knows?” And that is when (even though I had seen the episode before) I went into a laughter fit last Thanksgiving, making my family in the other room think I had utterly lost my marbles. Spike gets an invite...sort of. Update: Just did a rewatch and discovered another issue for me with this episode. “Pangs” is meant to set up a Buffy/Angel crossover event. Angel eludes Buffy throughout the episode and is only on the fringes of the episode’s action. However, after learning at the end of the episode that Angel had visited, Buffy travels to L.A. to confront him in “I Will Remember You.” And that is one of the most depressing episodes of Angel, and one I tend to avoid. Therefore, I think I blocked “Pangs” as it is a precursor to that. However, Buffy’s zeal for the perfect Thanksgiving, the question of ethics involved in vanquishing the Chumash tribesman, and mini-monologues about the origins of Thanksgiving (Willow’s anti-Thanksgiving stance v. Spike’s ‘to the victor go the spoils’ stance) all make this an out of the ordinary holiday episode. New Girl’s “Thanksgiving” episode got me thinking about some old favorites and where they have succeeded when it came to a themed Thanksgiving episode. 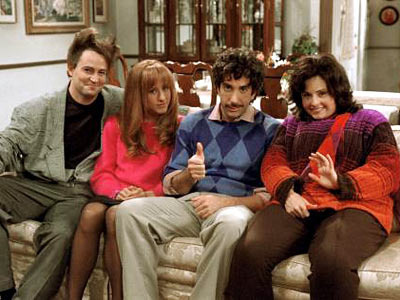 The first show that came to mind, and indeed the show that should be praised above all others for its Thanksgiving efforts, was Friends. Once I opened those floodgates, nearly 10 seasons worth of memorable Thanksgiving episodes came rushing forth from the sitcom center of my brain. Except for season two, where I assume the show was more concerned about Ross/Rachel drama (I mean the holiday happened immediately following the fallout of “The One Where Ross Finds Out”), a Thanksgiving-centric episode was produced. 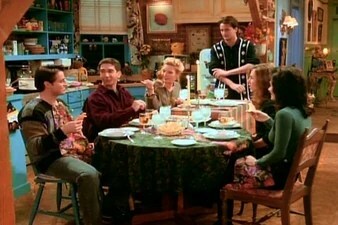 I mean, we get to flashback to the Geller’s house for Thanksgiving where Monica is fat. then newly skinny and Chandler not only rocks A Flock of Seagulls hairstyle but also loses a toe. Never was it a more fitting episode for present Chandler to tell Monica “I love you” for the first time, especially since we know much Chandler HATES Thanksgiving. Honorable mentions: “The One with the Football” where the Geller’s trademark competitive streak asserts itself, “The One with Chandler in a Box” that explains itself, sixth season’s “The One Where Ross Got High,” where Rachel attempts a trifle that has the suspicious ingredients of beef and peas (that may or may not taste like feet) and what I think about whenever I make a shepherd’s pie. I don’t wanna hate on seventh, ninth and tenth seasons, but Chandler’s dislike of dogs, Rachel’s sister visiting and everyone being late do not have as much of a stranglehold on my memories.